GiveGab is a giving platform for not-for-profit organizations and comprises a growing community of more than 35,000 not-for-profits. The user-friendly interface is specially designed for non-profits and makes it easier for them to launch and customize engaging fundraising campaigns in less time. The simple yet powerful fundraising and engagement features empower non-profits with the tools they need to boost fundraising and engagement. The online platform features giving days for non-profits, higher education institutions, community foundations, and GiveGab partners. Features such as unlimited fundraising pages, custom branding, and social sharing tools allow non-profit organizations of various backgrounds to increase revenues and engagement without having to conquer complex software. Premium features of the platform include full engagement history of supporters, individual-level notes, custom supporter tags, and properties. GiveGab is available in three different versions: Launch, Boost, and Enterprise. Launch is designed for fundraising and includes unlimited event fundraising, campaigns, crowdfunding and administrators. Boost is suitable for non-profits that, in addition, to fundraising also want to track and engage. Boost includes everything in the Launch package plus allows contacting uploader and offers enhanced tracking and engagement of supporters. The Enterprise plan allows large organizations to create robust forms that are embeddable and fully customizable. The plan allows syncing with Salesforce or Raiser’s Edge, editing with CSS and makes it easier for donors to cover any applicable fees. Custom options are also available for non-profits that have their own unique requirements and need something more tailored to their culture. However, all pricing plans are not applicable to the Giving Day hosts until the participants conclude the giving event. Organizations wanting to host a giving day can get a custom quote, while the participants can find more information and applicable fees online. Giving Days help organizations increase awareness and attract new donors by letting them participate in a cause. GiveGab makes the donation collection process more efficient and effective by allowing non-profits to run crowdfunding campaigns. The built-in social media and messaging features enhance supporter engagement, while marketing and communication tools allow creating custom and branded content to effectively communicate with the audience. If you are interested in GiveGab it might also be a good idea to check out other subcategories of Best Fundraising Software listed in our database of SaaS software reviews. Each organization has different needs and requires a system that can be personalized for their size, type of staff members and buyers, and the specific industry they are in. For these reasons, no platform can proffer perfect features out-of-the-box. When you try to find a software system, first be sure what you want it for. Read some GiveGab reviews and ask yourself do you want basic tools or do you want advanced tools? Are there any industry-specific tools that you are searching for? Get the answers to these queries to assist your search. There are multiple aspects that you need to consider and these include your budget, specific business wants, your organization size, integration requirements etc. Take your time, use a few free trials, and finally zero in on the system that provides all that you need to boost your company effectiveness and productivity. How Much Does GiveGab Cost? GiveGab has a free basic plan for organizations running a single fundraising campaign or those who want to try the platform before selecting a plan. A free trial of the paid plans is available by request. We realize that when you make a decision to buy Fundraising Software it’s important not only to see how experts evaluate it in their reviews, but also to find out if the real people and companies that buy it are actually satisfied with the product. That’s why we’ve created our behavior-based Customer Satisfaction Algorithm™ that gathers customer reviews, comments and GiveGab reviews across a wide range of social media sites. The data is then presented in an easy to digest form showing how many people had positive and negative experience with GiveGab. With that information at hand you should be equipped to make an informed buying decision that you won’t regret. What are GiveGab pricing details? What integrations are available for GiveGab? GiveGab integrates with the following enterprise systems and apps. More information available from the official support. 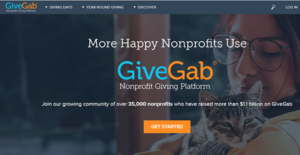 If you need more information about GiveGab or you simply have a question let us know what you need and we’ll forward your request directly to the vendor.